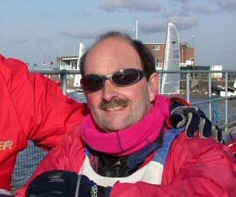 Howard has been racing Flying Fifteens for over 20 years, and probably has his name on more Trophies than anyone else at Datchet. Howard sailed many years with Gerry Sheard and they had great success. In recent years, Howard teamed up with Richard Jones in 3644 in which he also enjoyed considerable success – winning most of the Club trophies at some time or another. 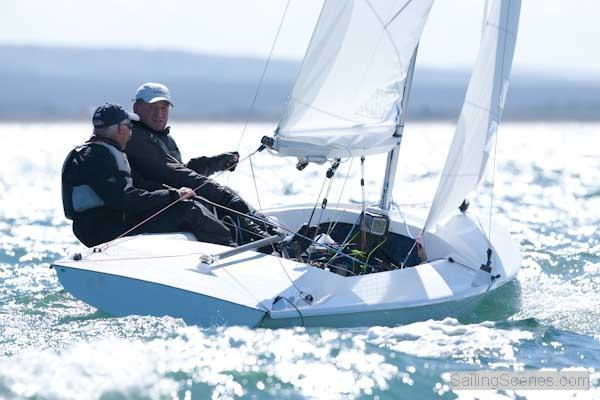 In this webpage, Howard talks us around the Datchet racecourse…. Ffirst off, it is useful to grab a couple of weather forecasts before you leave home. Whatever the forecast says though, nothing is as good as using your eyes when you arrive. What you are also looking for, is whether the wind is going to back or veer during the race period. We carry a little hand-held anemometer if the strength is difficult to agree visually. Generally, we use the same shroud positions in all conditions, but lots of other things vary – and we normally carry different sails above 12 knots or below it. 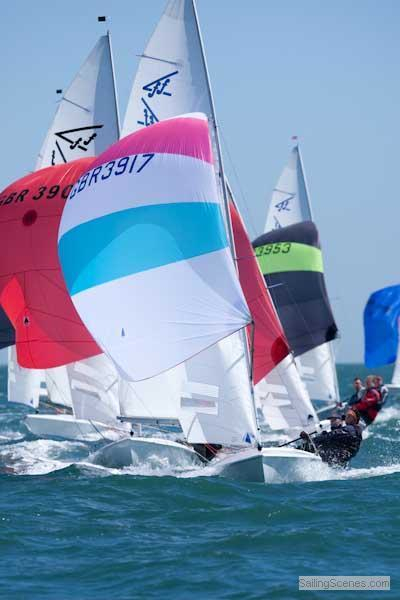 These days most races at Datchet are port handed, so we always pack the spinnaker in the port bag from the outset. If it is a North West wind, launch a bit early as you may need to slip the boat around the right angle at the end of the pontoon. Don’t forget to pack sunglasses and some water. Only Philip takes chocolate! In 3934, we have one of those ballistically complex Tacktick compasses that has a race timer built in. Hopefully we’ll have had time to program the Tacktick wind indicator and check the line, but once I set the timer at the 5 minute gun, at least we can both see it easily. We both make timing calls ! I tend to tell Richard what the competition is up to, and there is no doubt that we make stronger starts when the pin is favoured. Sadly though this tends to take you up the left, which half the time is not the best way to go !!! Getting up the beat, I watch the competition and try to give some reading on how well the boat setup is going for speed and pointing. We may need to adjust the jibcars, the rig tension or whatever. If it’s blowing a bit, we try and find the right mast bend, and maybe a spot of Cunningham. Once we have started, we don’t talk all that much. It’s a pretty quiet boat – the only exception is when we’ve put a hole in it! A quiet boat is a happy boat, except if you sail with your spouse!! ….Instead we concentrate on what we have to do, and I keep a keen eye on the competition and the wind. I like to keep the jib very neatly trimmed by watching through the top window, and we adjust it occasionally on the beats as the wind strength changes, or tactics dictate eg more pointing or drive needed. Just occasionally, we find we have the spinnaker in the wrong bag, and if we have then sometimes we’ll drag it between bags up the beat. It’s hard to keep the boat going at its best, so it’s a tactic we use sparingly. In the old boat we had a standard 360 degree ball compass which was easy to use for shifts. The new Tacktick does all that for you, but to be honest we didn’t find the old one at all hard to use. At Datchet though, you need to keep a close eye on the shifts. We’ll tack on a 10 degree shift and sometimes even a 5 degree – but I give the shift time to settle before calling. I generally give the call on the lay-line, and have a slight preference to approach on port on a port handed course – if traffic allows. On our approach to the windward mark, we decide together what the route will be and how the rounding will go. Since our Greg Wells training weekend, we try and keep a focus on keeping the speed going at all costs. So easy to kill it during a hoist. If it’s possible to pre-launch the pole, we do that and get the twinning lines set. We round the mark and I set the pole (if not already out) and Richard hoists. While I set the guy to its mark, Richard grabs the sheet if it’s not too breezy and tries to get air in the sail quickly. Only then do we reset kicker, outhaul etc. Along the reach, we really enjoy the boat, but I can’t take my eyes off the spinnaker – even for a moment. If it isn’t too manic, I get commentary from the back as to how it is going, what the competition is doing, where the breeze is. Once powered up though, we get well back and mainly just concentrate on getting the most speed we can. The main thing for me is to keep the spinnaker luff almost at the curl point and get a pole height that causes the curl to happen in the centre of the luff and not high or low. In our boats, we’ve had the pole height adjuster led forward so that I can easily look at the sail at the same time as trimming the pole. We both tend to have a shot at trimming the jibsheet, whichever hand is spare. The further back we go in breezes though, Richard has less chance of grabbing the jibsheet, so it’s for me to do. In general, we’re very quick on these legs, especially in a breeze. We might sometimes straighten the mast a tad if we can hold it in the breeze or the leg is broad enough. As we approach the gybe mark, one of two things is going to happen. A crash gybe or a proper gybe! We’ve tried fly-away poles on a couple of our boats, but always end up removing them – primarily for the crash gybe scenario. Anyway, lets suppose it’s a proper gybe (!) 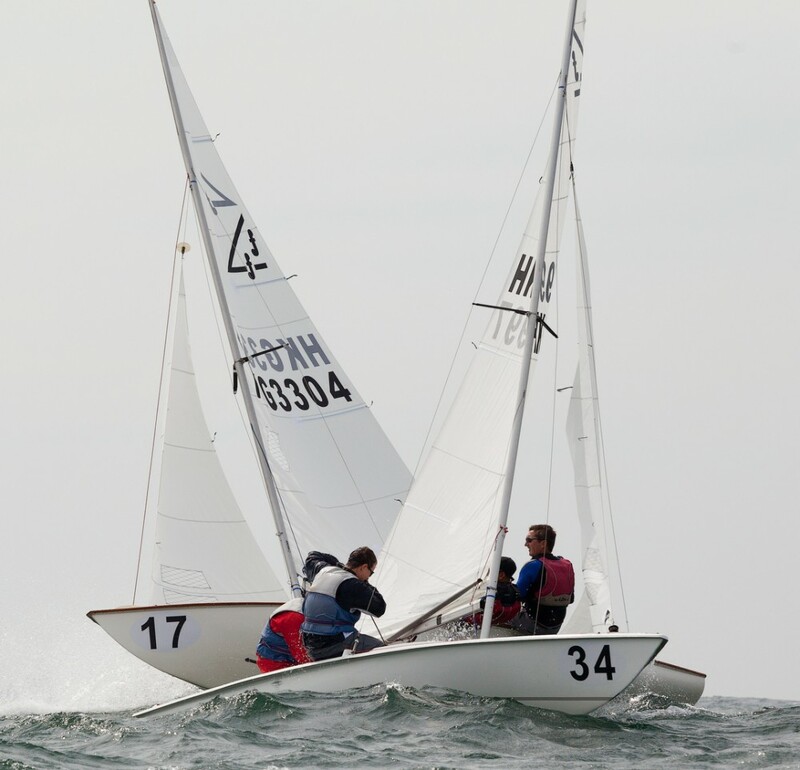 – as we come up to the mark I get the lee twinner down first, then around we go, pole back, jibsheet off, as we turn. Usually if we have been quiet, this is when the shouting starts. As I shift the pole over, I want the guy taken back to its mark (lets hope that twinner was down far enough!) while I’m at the mast. Richard is not great at always doing this for one reason or another. So if I have to get to it, Richard is at the sheet trying to get the sail going – then I take it from him when we’re set. Somehow the jib gets reset…. And we’re off. Usually I must say, it’s pretty good and we look to make distance on these two legs. We generally have that twinner right down, but Phil Evans always says to fly it 10-12 inches off if the next leg is very broad. So what happens ina crash gybe? Well – it all happens at once, and especially that pole needs to be aggressively pulled back to stop the sail flopping through the triangle. And tidying up takes longer. And there is a bit more shouting from the back! We have to decide first on late or early drop. When that’s done, the kite comes into the windward bag as quickly as possible, and the pole is stowed. I take the sail height down first and the foot second. Richard gets the outhaul on. Often I’m still tidying up as we round. If there’s a lot going on at the back, then after I’ve set the jib, I take the mainsheet in two handed. I take the last bit of genoa in once the boat is moving. Relative to a chute, the bags are much better at this point. The big issue at the top of the next beat is “windward or leeward hoist”? 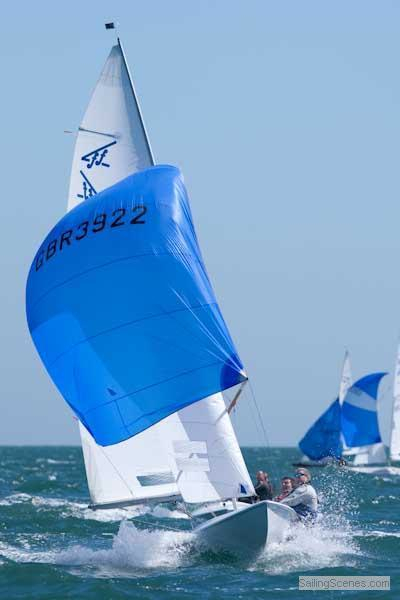 On the normal leeward hoist, from bags system gives a very fast hoist, and of course there is no downhaul line to spoil the sail curve in light airs. However, what if it is a windward hoist?? First I set the guy to an approximate setting, then get the sail rolled up in a ball in my arms. I shout for the hoist as I throw and Richard whacks it up at the same time. Theoretically…. This can be awful but it improves with practice. When it works well, the sail sets and draws very fast. 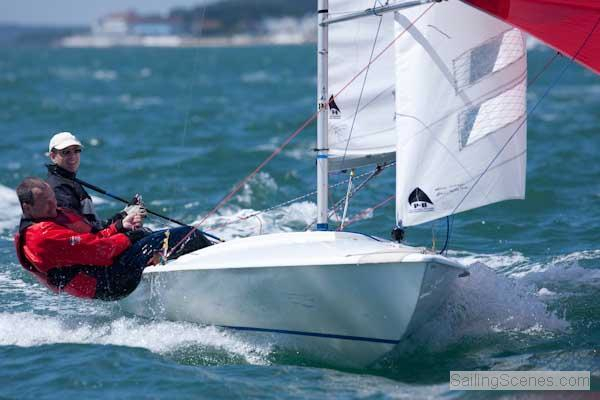 When the wind is very much aft, it works very easily as the wind takes the sail away from the danger zone. Then I sort and fly the pole and hopefully it doesn’t drop off the guy or something awful like that. The pole height sometimes needs lowering on the run. If the jib is collapsing in on the slot, I usually am the one who decides to furl it, though both of us can reach the line. It goes away in one armful of line. 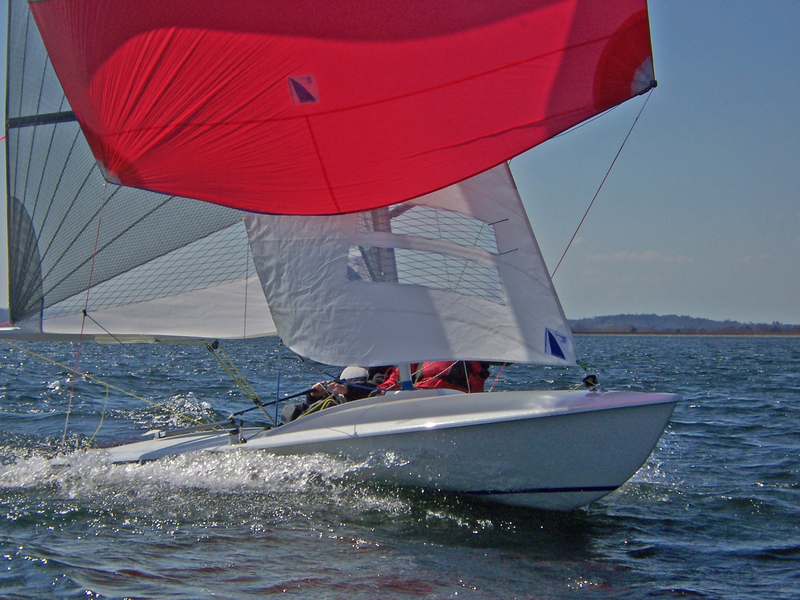 It’s nice to be on the right gybe at the bottom of the leg that the sail naturally goes into the correct bag. If it isn’t, then there is a choice of stowing the pole and doing a gybe drop, but I confess we don’t do it often. We’ll set the spinnaker right up to force seven, so in a breeze this can be a fractious leg. At the bottom, maybe going so fast that the helm is having kittens, the damned sail has got to come down. It is at this point that we thank heaven we went for bags and there is none of this tiller between the knees thing. Anyway, the sail comes down as fast as we can. In controllable breezes, I get the genoa out first, but in a blow it comes out as we round. Generally there is a bit of tidying up to do. 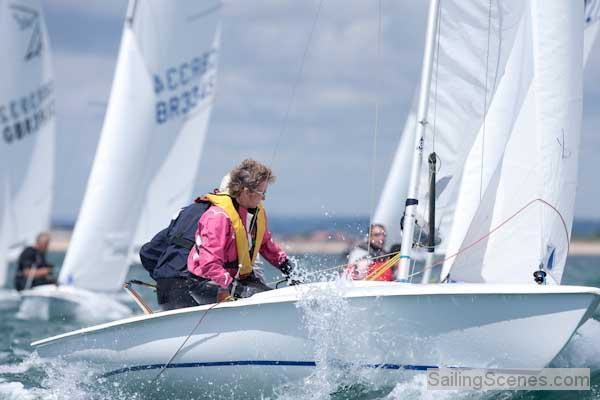 We love these reaching finishes that we tend to get at Datchet. They are often very exciting and the major things are to round the lee mark the right side and then chose the optimum end of the line. We keep the boat going as fast as we can until we are over the line, and then hope we can get the kite down before the wall appears through the spray…..